Joseph Austin Benwell was an artist whose work was surprisingly varied, ranging from black and white engravings and woodcut illustrations for books and journals in the earlier part of his career, to coloured lithographs and later still, large watercolour paintings. His subject matter was mainly scenes from India and the Near and Middle East, his engravings of scenes depicting life in India in early and mid-Victorian times being particularly well-regarded. His output was really quite prolific from the early 1850s through to the early 1880s. More detail is given in each of the sections below. Two of his earlier works are coloured lithographs featuring scenes from the Crimean War (1853-56). 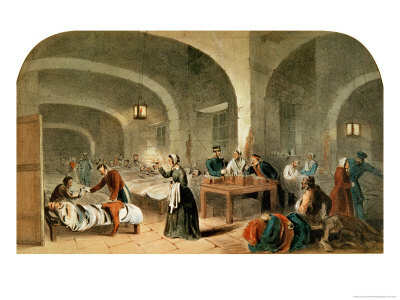 His 'Sketch of a Ward at the Hospital at Scutari' c1855, signed J A Benwell lower right, depicts Florence Nightingale as the lady with the lamp, in an iconic image often seen at exhibitions today. Ulrich Keller, in his book ‘The Ultimate Spectacle: A Visual History of the Crimean War’ (Routledge, 2002) states ‘If most Crimean hospital depictions spoke a decidedly romantic idiom, it must be emphasized in conclusion that one lithograph does seem to qualify as a reliable eyewitness account of the situation in the wards of Barracks Hospital. The artist of this undated but clearly contemporary print is the domestic artist J A Benwell, who must have made use of a fairly precise amateur drawing from Scutari. ……. - Benwell’s emphasis is indeed on organization, administration, professional service, and to this extent Nightingale’s work at Scutari did find at least one pictorial chronicler, after all.” I would, however, query the description ‘domestic artist’ used in the book. Lesser-known is the battle scene shown in 'The Heights of Alma, the Day after the Battle' (1854). 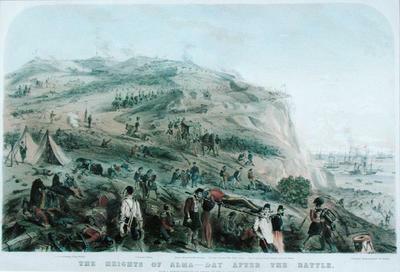 The Battle of Alma, considered to be the first battle of the Crimean War, took place just south of the River Alma in the Crimea.on 20 September 1854. It is possible that Joseph Austin Benwell was an eye-witness to these scenes as he was travelling back to India at the time. 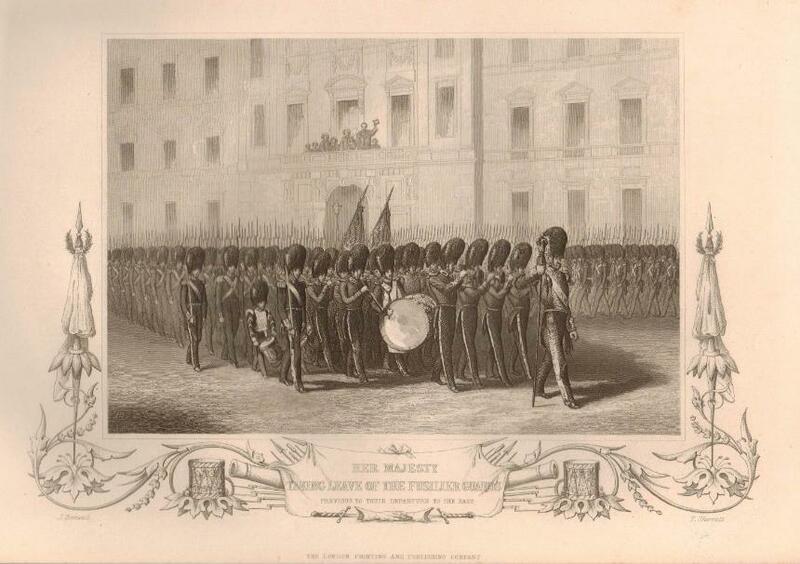 Another of his Crimean War works was the print 'Her Majesty taking leave of the Fusilier Guards previous to their departure to the East' which was published in ‘The History of the Present War with Russia’ by Henry Tyrrell, 1858. It was after his return to London from India that he produced a prolific number of engravings and illustrations that were reproduced in various journals published by the Religious Tract Society, for example 'The Sunday at Home; a Family Magazine for Sabbath Reading' which include many illustrations by him during the years 1856 to 1870. His entry in the Modern English Biography ( Vol IV c.373, Frederic Boase, publ. Frank Cass & Co Ltd 1892, 1908, 1965) states that he '...executed thousands of wood blocks for the Religious Tract Society to about 1876, and in Missionary publications; illustrated The Illustrated London News and Sunday at Home for many years...'. 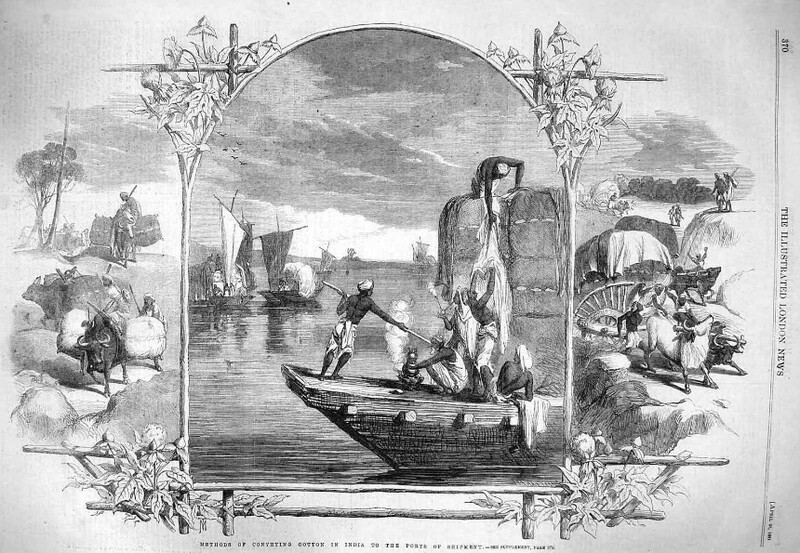 Most of his engravings for the Illustrated London News during this period featured scenes from India. In the early 1860s, Benwell experimented with hand painting 'dissolving views' on glass transparencies, projected onto a screen such that one view appears to pass into another. Benwell painted several series which were used to accompany lectures and exhibitions, such as those at the Royal Polytechnic Institution in London in 1862. 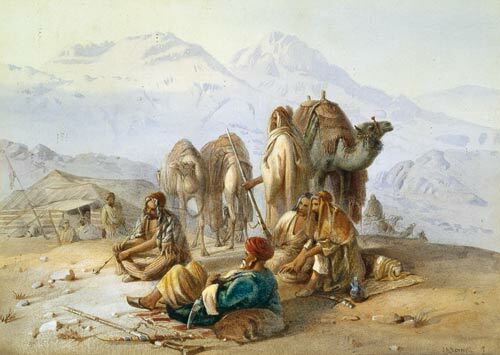 Western artists who travelled through the Near and Middle East from the start of the nineteenth century, painting their experiences as they travelled to countries such as Turkey, Persia, Iraq, Egypt, Lebanon, Palestine, Arabia. For example, pictures below left 'Arabs praying in the desert' and 'An Arab Encampment'. Including illustrators and engravers in Victorian times who recorded scenes on every-day life in the far-flung empire, informing readers of publications such as the Illustrated London News. Some of these images can appear rather quaint and quirky to modern eyes, which adds to their appeal. Benwell illustrated two books about India published in the early 1850s, including 'The Three Presidencies of India' by John Capper, 1853, and 'Our Indian Army: A Military History of the British Empire in the East'' by Captain Rafter, 1855. He also produced engravings for the journal 'The Leisure Hour: A Family Journal of Instruction and Recreation' on the theme of India, for example the pictures below upper right from 'Indian Experiences in 1857-58' (The Indian Mutiny) from 'The Leisure Hour' 1862. Such as those published by the Religious Tract Society, with their paternalistic, benevolent and evangelical missionary quality, often seeming somewhat old-fashioned when viewed from a 21st century perspective. For example, picture below lower right from 'The Sunday at Home, a Family Magazine for Sabbath Reading' 1857. 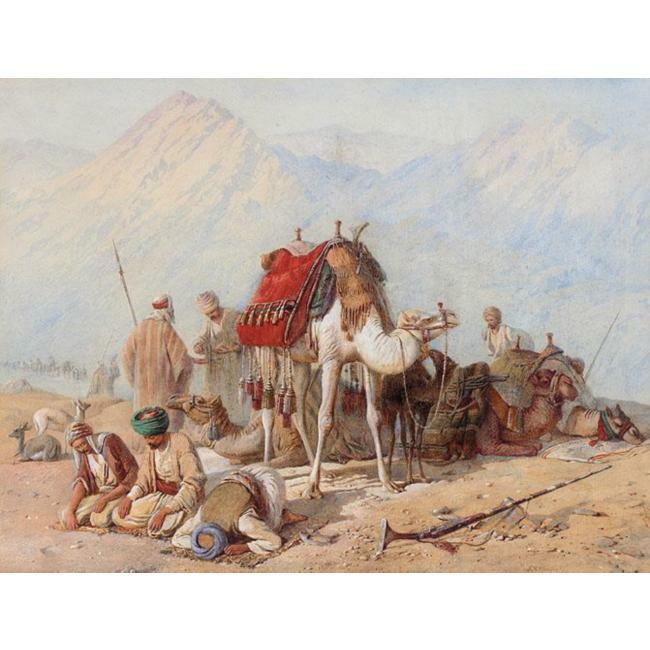 Many of Benwell's Orientalist paintings are listed on websites such as Blouin Art Sales Index and MutualArt. Please click on each link above, or the pictures below, for more about each category. Benwell also specialised in making montages of some of his works. Several are shown on the page below.